Mirror’s Edge Catalyst is a game that is very invested in recreating the experience of parkour. Like Mirror’s Edge, Catalyst places a player in the shoes of a “runner,” an urban courier who uses athletic and acrobatic skills to deliver or retrieve illicit goods. The fashion design, with neon highlights and form-fitting silhouettes, emphasizes the speed and agility of the game’s characters. Private security often force runners to employ martial arts skills to avoid beatings and imprisonment. The first-person perspective immerses the player in every nauseating jump, roll, and dropkick. While all of the properties listed above are in both games, Catalyst goes one step further. 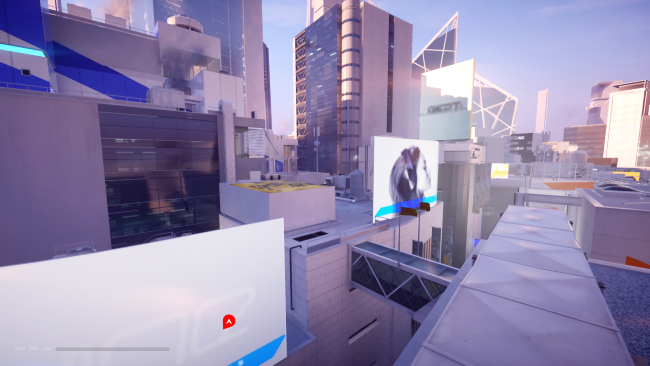 Mirror’s Edge was linear and divided into distinct stages, but Catalyst allows the player to navigate an open world akin to those of Assassin’s Creed or Grand Theft Auto. There are several distinct districts of the city which the player can wander through. Completing specific story missions unlocks further areas, creating more routes at any given moment. In theory, this should have made the game more faithful to the experience of doing parkour than the original, which had players running through—sometimes literal—obstacle courses. However, most reviews severely criticized the choice to make the game open-world. As Ed Smith says in his review for Vice, “traversing Catalyst’s world is slow and mitigated … there is perhaps a greater amount of freedom [than in the first game] but that shouldn’t be confused with an increased sense of momentum”, which is what he claims Catalyst should be striving for. Instead of letting the player feel athletic and fast, Smith notes, the open world often causes them to get lost and run in circles. Instead of being a runner, the player becomes a moth running into a window, fruitlessly trying to reach objectives the minimap tells them are only a few feet away. I agree that the choice to move to an open world was a mistake, but for quite the opposite reason. Although the player can sometimes find themselves at a loss for where to go, the game puts heavy emphasis on making sure the player is always chasing a path to keep up their momentum. Lost or not, it feels like being deep in the bowels of an accounting office. The game vigorously encourages the player to vault over as many waist-high objects as they can, but the end result of this action is always the same – an increase in speed. This prevents the player from being creative or playful with their movement, and reduces playing the game to a hollow test of efficiency. To understand this problem, it’s useful to look at exactly why traceurs (real-life runners) actually practice parkour. Michael Atkinson attempts to do just this in his 2009 essay “Parkour, Anarcho-Environmentalism, and Poiesis”, where he describes the lifestyle of several traceurs in Toronto, Canada in the context of Henri Lefebvre’s The Production of Space. Atkinson says that since the values of a society bleed into the design of its cities, and since modern Western society is often focused on efficiency and production, the act of movement through these spaces is also directed by these same values. This manifests as timed crosswalks, roads strictly directing traffic, commercial zoning, and harsh-looking, space-efficient skyscrapers. In these places, there is literally no room for anything but objective-oriented navigation, alienating people from the pleasure of moving. Traceurs, however, overcome this by moving through cities in ways that were not intended by their design, whether this means balancing on benches or running up walls. Thus, Atkinson posits that their activity “destabilizes and disrupts the … meanings of a city’s physical and social landscape,” allowing them to reclaim their environment from the Taylorist values which constructed it. It’s exactly this that Catalyst fails to reproduce. The player is ostensibly given the freedom to go wherever they please and move through the city however they see fit, but this is decidedly untrue. Although there are hypothetically many routes and tools a player can employ, ultimately these are all planned and designed. The exact same restrictions that real urban spaces create are built into the physics of the game world. There is no way to disrupt intent. Unlike “real” parkour, the act of movement itself is not autotelic; it can only be used to accomplish something else. A perfect example of this is found in Glass’ most affluent residential district, the View. Characterized by massive apartment complexes, sunshades, and an absurd amount of glass windows and doors, this area is completely focused on showing the wealth of the corporate owners who control the city. 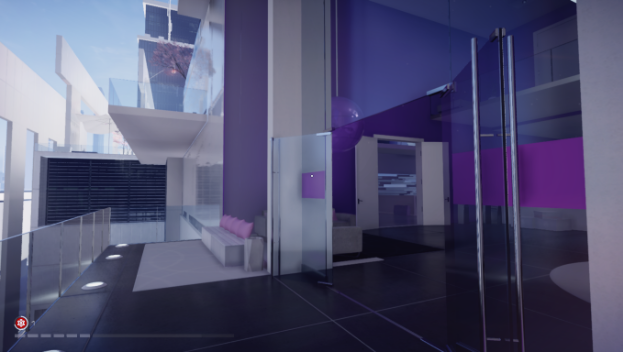 But unlike most of the other areas of Glass, there is no comfortably open rooftop on which the player can direct themselves – they are hemmed into a path which winds its way through several mysteriously empty apartments. While they’re very pretty, moving through them feels completely arbitrary. Some doors are open, some balconies are traversable, some ledges have ziplines at the other end, but most do not. There are no personal effects, no debris that marks the presence of other people. These areas feel less like living spaces and more like a set of doors, walls, and windows that have been cleverly arranged to look like such places, almost as if the owners themselves design these rooms so that they can enjoy watching someone move quickly through them. And although it might appear in some way subversive to run through what are ostensibly homes, the game never frames them as anything more than a place to put obstacles. The doors never close, the owners are nowhere to be found, and regardless of what the player does, these rooms don’t change in any way. They can never be anything more than a means of progression, and thus only ever reinforce the idea that the player must be moving towards a goal, much like modern cities. The View is far from the only place that the player is reminded of their lack of choice. 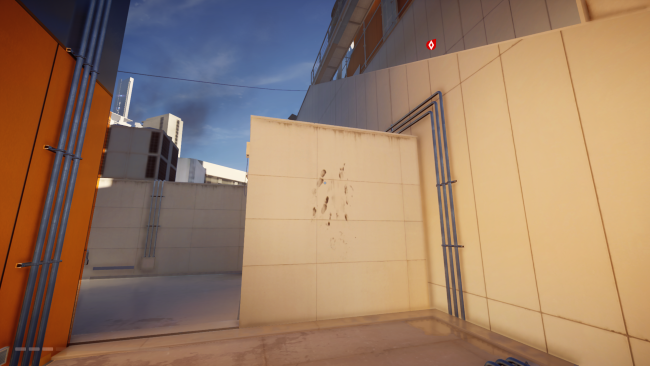 The entire city is plastered with scuff marks which are designed to indicate a wall which the player should be running up, or a vent they should be sliding through. They show the player that the paths they tread have already been mapped out and used by many runners before them, and that they are simply following a predetermined route. In some districts, many doors are inexplicably open and remain that way forever, as if someone expects runners to be passing through them. There are even special boards placed in locations where players are expected to jump from, so that they know they are following the correct path. This is the central problem that the game faces: by making these routes more apparent to the player, they also telegraph that parkour is not subversive at all, but accepted and even encouraged within the city. Nowhere is this more apparent than in the way the game’s private security forces interact with the player. Although they have attack helicopters, drones, and numerous foot soldiers, the only reason the player will be pursued is if they stop running, either in front of a security camera or a group of guards. Even running through a group of armed guards only causes them to yell and flail helplessly as the player sprints past. As long as they keep moving towards a goal, the game—and the city by extension—does not care. In fact, the only thing that the player can do to incite the ire of Glass’ security forces is to literally stand still, ironically making a mundane action in real life become the most radical in the game. In Glass, the only thing that is frowned upon is a lack of constant, productive movement. Mirror’s Edge Catalyst desperately wants to emulate the sport of parkour, from the motion-captured rolls to the bright red highlights on the protagonist’s clothing. But by designing the game’s world as a series of linear obstacle courses, parkour doesn’t feel like disrupting the mechanical movements of a post-industrial society, but simply a different way of moving through Taylorist-designed urban spaces. In the end, Catalyst is not so much an imagining of a radically different dystopian future, but an unfortunately realistic reflection of efficiency-focused 21st century society. And in a world that is increasingly filled with media reinforcing these same ideas, such a game is hardly a catalyst for anything. Maia is a student of fungi and classical languages, and occasionally dabbles in games. She lives in Arizona, where she can be found defying the weather with a wide array of winter clothing.